This was a tough workout but No man was left behind. ANNOUNCEMENTS:Congrats to Herbie for selling his house. Plan on Fast N Easy moving him to the new house!!! THE SCENE: upper 60s, felt good. Quick warm-up….I was running late! Mosey to the hill at the back of campus. Do the following exercises while running up & down the hill. Count the reps at the bottom of the hill DORA style. 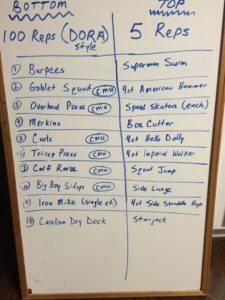 We also only did 50 burpees for the sake of time. Trash can to trash can run on the way back to the AO. Sprint to each can, then do 10 merkins when you get there. Let downs are inevitable. When someone does let you down, remember they are a fallen man just like you are. None of us are perfect. Lift each other up in prayer and forgive others when they mess up. Rucked back to the AO with just enough time for 30 Flutter Kicks (4ct. – ruck overhead). Ended up covering 5.7 miles for the morning along with the PT. 3 men today for the ruck but several others were out there taking care of business with their HTL training (Cap’n Crunch, A-Rod, Abort, and Pfeiffer). Not much of a BOM this morning, but we enjoyed the fellowship along the ruck. Lots of good mumblechatter about favorite flavors of Gatorade and Powerade (amazing how those conversations start when you’re dead tired and thirsty). In the spirit of Father’s Day weekend, we’re all thankful we have the privilege of being Dads – make the most of the moments you have with your kids and be intentional with your families.